Like sharing all the ways I strived to plug into this community – the neighborly outreach, patronizing mom & pop shops, volunteering for local organizations, attending Meetups, art events, literary groups, and of course music jams, as that random stranger who just shows up. Or how the weather seemed so excruciating when we arrived – how I referred to it as a “hellscape,” “abominable,” “unbearable” – but how now, at least so far, it doesn’t seem that bad. How the heat almost feels… good. Or how I can tell the difference between a native and non-native anole, or can now identify approximately seventeen varieties of palm. I’m serious. Or how I put and end to my long-standing hostility towards the Disney empire. A sign of maturity, I’m sure. The more I thought about what it was I really wanted to say, the more flummoxed I got. It seems there’s so much to say… and yet for reasons inexplicable, I can’t put it into words (at least right now). So instead you get photos. Note: If there’s a critter you’re particularly interested in and want a more dedicated post about it in the future, please leave me a comment. Hope you enjoy! We’re pretty sure this was a baby bufo. Hundreds of them burst from the ground like popcorn when we first arrived. Heavy rains would wash them into the pool. Doesn’t this little guy look chill? Just hitching a ride on an orchid leaf. This bug confused me after I noticed it in the exact same spot for a few days in a row. I told Tim, you have to come see this crazy gold bug! He said, That’s just a shell. But yeah, crazy. These little guys are everywhere – brown anoles, which came from Cuba and have displaced the native green anoles. They are cute little dinosaurs who do tons of pushups, climb and scurry about at lightening speed, leap through the air, and of course, eat lots of bugs. I sometimes give them offerings! See lots more lizards here. This monster lives at the Morikami Japanese Gardens. We went there for the Obon (Lantern) Festival last September. I had pictures in my mind from a Kelly Luce short story collection I’d read and imagined it would be magical. Plus it’s the biggest event at the Morikama Gardens all year. What I didn’t realize was that, of course, it sells out months in advance, so having decided at the last minute that we absolutely had to go, I went to all lengths of ridiculous effort and expense to obtain tickets. I was so excited! So we went. And basically ended up waiting in an unbelievably long line that wound its way through three separate parking lots, then waited in line again for vending tickets, and again for food, and again to leave. It was awful. But we did get to see the majestic creature above. This is the caterpillar of a Giant Swallowtail. Its “disguise” is that it looks like bird poop on a branch. It really does. At first I though it was a fungus growing on my lemon tree and almost hacked off the branch it was on. I really need to wear my glasses while gardening. I crouched on hands and knees, peering between the blades of a bromiliad, to see this critter after it slithered its way down our stone path. At first I thought this was a snake, but it turns out it’s a legless lizard! Technically, a Glass Lizard. Did you know that even existed? I sure didn’t. We have two wetland nature parks we visit all the time, Green Cay and Wakodahatchee. Wakodahatchee was the first recycled water wetlands restoration project here, so it’s more established and is where the shot above was taken (see more photos here). It’s where a variety of birds nested this spring and summer, such as the Wood Storks with babies. or this Eastern Gray Squirrel. In Oakland sometimes flocks of wild turkeys would come through our yard. Here, it’s flocks of Ibis (these are the brown variety). We have lots of dragonflies but they’re so fast they’re nearly impossible to photograph unless you catch one perched, like this beauty. We have different kinds and I have yet to learn all their names, but suffice it to say, they all love to eat mosquitoes, so I love them all! 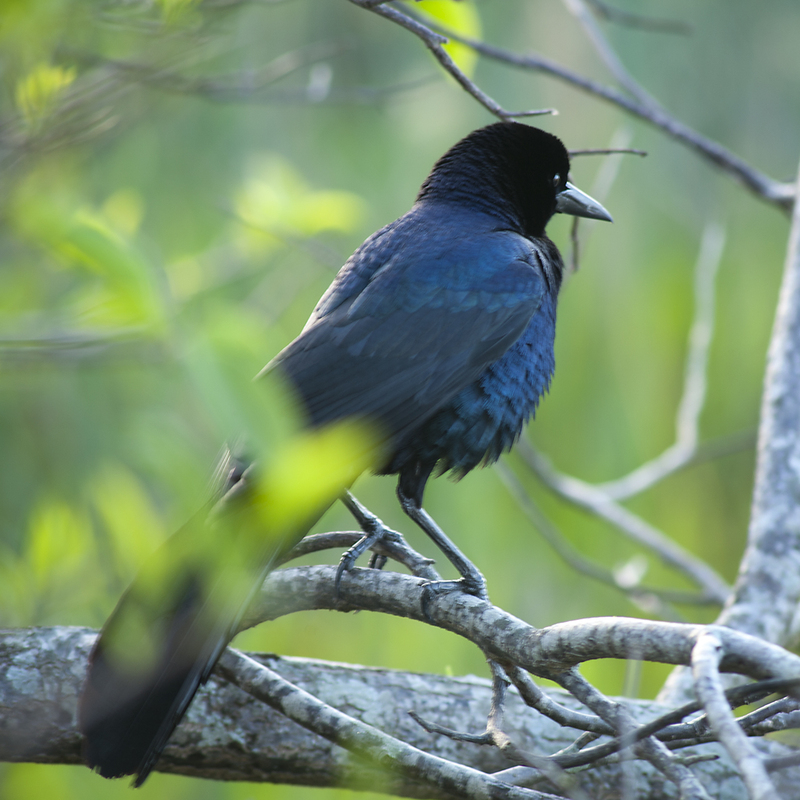 This is a Great-tailed Grackle. It’s sort of crow-like and has some pretty interesting vocalizations that it does. Beautiful color. This is our resident Pooping Iguana. She visits often, though we often only see the trinkets she’s left behind. We have a ton of butterflies, but like the dragonflies, they’re kind of hard to photograph. Above is a Monarch in our Jatropha tree. And below is a cool caterpillar I saw at the local nursery. I’m not sure what this turns into. Do you know? If so, please leave a comment. Our little buddy is back. This was taken in January. I love the light in winter – low, slanting, and gold. This is a creature of the night. He and his pack of friends (family?) live on our front porch and wriggle around incredibly fast near the light fixture. I believe it’s a Mediterranean Gecko but I’m not completely sure. They eat moths and cockroaches (yay!) and are adorable and chirp like cricket-birds. I love them. Remember the woodpecker from our first month in September? Well now there’s a baby. These shots were taken just a couple of weeks ago. The momma’s looking for food in the shot above, and feeding it to the baby below. This spider has spun a crazy stabilimentum. I just learned this term, and if you want to have your mind blown, search Google images for “spider stabilimentums.” Actually, what the hell, I’ll do it for you. Go here to have mind blown. These are Ibis, like the flock in our front yard, but these are White Ibis, which are all white, except for black tips on their wings. And lastly, this terrifying girl greeted me early last September. She hung around (literally) for a month or so, then vanished. Well, it’s that time of year again now, and she and all her giant girlfriends are hanging everywhere. I think it’s when they procreate. See full post here. These pictures are great, and the videos were a nice touch! Love our critters and plants here!